A gourmet’s delight, the Relish Food and Wine Festival will take place in the heritage city of Maryborough on Saturday, June 3. Maryborough’s magnificent portside precinct – incorporating Queens Park, Mary River Parklands, heritage streetscapes and the Mary River – serves as the distinct backdrop for a day of indulgence. Leading chefs that will be shining the spotlight on the Fraser Coast region’s finest produce include 2013 My Kitchen Rules champions Dan and Steph Mulheron, Michael Cox from Muddy Waters Café, Tom Jack from Coast Restaurant and Bar, Rocco Turina from Villa Cavour and Saul Collins from The Vinyard. Dig into fresh Hervey Bay scallops, gourmet sausages and cheeses… matched with awarding winning wines and some of the finest craft beers from across south east Queensland. 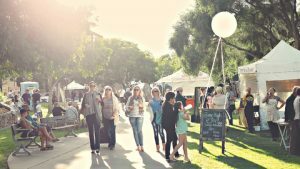 Cooking demonstrations, boat rides along the mighty Mary River and stalls from some of the region’s favourite restaurants, cafes and producers are all part of the festival favourites again in 2017. Camembert and brie making workshops by award winning permaculture teacher Elisabeth Fekonia. Make, sample and take home the delicious recipes. Tickets $5. The Bond Stores Gauger has plenty of stories to share at Tipples and Tales. Enjoy delicious platters, ports, liqueurs and good company as the Gauger reminisces on the good ol’ days. Tickets $30. Bush Tucker Talk and Taste has been a favourite on the big stage, but this year you’ll get up close and personal with the chefs and rangers from Kingfisher Bay Resort. Explore the tastes of Australia and discover the delights of our native bush tucker. Tickets $10. Relish Long Lunch is sure to delight yet again, with some of the area’s best chefs putting on a four course meal, matched with some of southeast Queensland’s best wines. You’ll be amazed by dishes from The Vinyard, EAT @ Dan and Steph’s, Coast Restaurant and Bar and Muddy Waters Café, whilst enjoying the stunning surrounds of Queens Park and enjoying the peaceful sounds of local entertainment. Sound delicious? It is! SOLD OUT! All aboard Amaroo, the Hervey Bay Boat Club’s beautiful vessel, for Bubbles on the Boat – the very best local sparkling wine and cheese platters, while cruising down the scenic Mary River. Tickets $30. Hill of Promise Winery and Villa Cavour have joined to present the perfect Food and Wine Matching session. Send your tastebuds into overdrive with delicious canapés and complementing wines. Tickets $30. Beer and Food Matching will send your tastebuds into overdrive, with Bargara Brewing Co and Bay Fusion Food Design pairing up for this incredible session. You’ll be taken through a range of pale ales, IPA and more delicious varieties. Tickets $30. Entry is $10 online or from Visitor Information Centres, or $15 on the day. Tickets are selling fast, so head to relishfrasercoast.com.au to get yours now!